good to hear... there are millions to come... May God Bless You...!!! yes,it will rise and rise more and more!! !God bless you and your family.you save us from contracting Kwashiorkor. Dani congratulation !!!!!! there will be so much more ! ke'sega fetena ke'mera nefese yitebekih. Dani Congragulation for all of us. Congra!!!!!!!!!!!!! This is just the beginning.I am sure the number could be more than this if Internet accessibility is easy in Ethiopia. D/n Dani, You are lucky to see all this and you are doing great things to our beloved church and our country as well. I am happy to see this and I wish to see triple in the near future. D/n Daniel Enkuan Abro Des alen. Egziabhere Amlak Antenina Betesebhen Yetebklen, Yeagelgilot Zemenhen Yibarklen. Yemebetachen Amalaginet, Yetsadkan Semaitat Tselot Kehulachen Gar Yihun! Egziabhere Amlak Kidest Hager Ethiopian Yibark! Amen. Thanks God for this achievement. 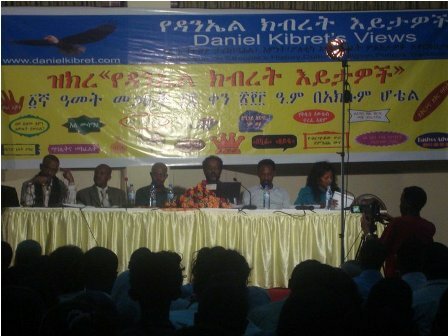 Yes, I hope there are lots of others to come and note also that though they are not members of the blog, there are lots to whom the contents are distributed through other medias like Sheger 102.1, Addis guday, words of mouth etc. God keep you in his bosom - you and your family! Hulun Lakenawone Egziabiher Kibir Misgana Yigbaw. Be-EGziabiher Yemitamen sew gena kezihm belay Yiseral. Dn. Dani Enquan abro des yalen. 78 million to go, at least. እንኳን አብሮ ደስ አለን ዳኒ!!! What exciting news, I am so proud of you and your strength, we are more than 10 milion. Because we are not counting friends which we tell them orally and give them hard copy. You are our " Giorgis Habib" who fought and kept the Egypt Orthodox church from the tehadeso and protestant. You are our True Ethiopian Orthodox son and hero keep it up. I have have just finished watching your preaching 'Ye seole dejoch ayechiluatim'. what a marvelous way of teaching and research and above all true and true and true. GOD bless u and all ur family. Please Daniek Kibret make plenty copy your new book 'Yohanes RAEYE' I will be the first person to buy. If u can please would u also make copy of some book of yours which u published before?? I could't find most of them from the market even in the Mahebere Kidusan shop Arat kilo. Please by the time u make z copies pls let us know on your site, we are more than happy to buy them, we have to pass it to the next generation as well. ሁላችንም እንደአንተ የሚጠበቅብንን ብንሰራ የት በደረስን! ዳሩ…..
ዳኒ ፍሬያማ ስራ ነውና በርታ! ቋሚ አንባቢህና በምክርህም ተጠቃሚ ነኝ፡፡ ጌታ አብዝቶ ኃይሉንና ጸጋውን ይስጥህ! Dani enkuan abro desalen yehulachin desta new! Congratulations for all of us. hi dani i used to hear u since you were at mahibere kidusan when u stopped to appear on the church's "awdemehirt" i was much desapointed but when u open a blog now i get u thanks pls keep it up. God blase u. i hope i am one of the millions. ዛሬ 2 ሚሊዮን ነገ 2 ቢሊዮን! ውድ ዲ/ን ዳንኤል እንኳን አብሮ ደስ አለን! ይህ እንዲሆን የፈቀደ ልዑል እግዚአብሔር ይመስገን፤ የሚያስተምር፣ የሚመክር፣ የሚገስፅ፣ እግዚአብሔር ነው ስለዚህ ባንተ ላይ አድሮ ሕዝቡን ያስተማረ፣ የመከረ፣ ያጽናና፣ የገሰጸ… አምላክ ክብር ምስጋና ይግባው፡፡ ላንተም ለውድ ወንድማችን ጸጋውን ያብዛልህ ከነቤተሰብህ በሰላም በጤና ይጠብቅህ እናታችን ድንግል ማርያም በረድኤቷ ባማላጅነቷ አትለይህ፡፡ አሜን !!! congratulation Dani! I`m very happy.Our God bless you & your family. thank you my teacher. አሜን እንኳን አብሮ ደስ አለን ዳኒ ለሁሉም እኔ ስጨመር ቁጥሩ ከፍ ይላል። አመሰግናለሁ!! * ከረሮን ለምን ይጮሃል ቢሉ ውስጡ ባዶ ስለሆነ ነው! ፩ድ አስተያየት ከላይ ስታነቡ "እና ምን ይጠበስ ይላል"
@Yonas...he is already deceived. what is left??? yehiw wudase kentu yifera yenbere sewye zare eulign simulign 2 million anbabi alegn yilenal tadia min libelew "min yitebes" kemalet wuchi. Lenegeru 2 million anbabi yetebalew ewnt kehone enkuan sew degagmo yemikeftew demo dani zare min zebareke bilo new. Beziya lay yanebebewu leguadegnaw yenegerewnm ayatekelilim.Silezih kezih belay new.Egziabher gena yabezawual. Just a question,does this number include the number of visits or actual IP addresess that are different? I know I visit the site few times a day and if everybody's visit is counted it may be a repeat visitors like myself,please clarify. Regardless of the count you should be congratulated for your contribution for the betterment of our society. spineless snakes that lurk in the dark just to make sure that something good never flourishes.You never have the courage to write your name nor just keep your peace and quite and just say nothing;better yet don't come and visit the blog if you don't like it. Ihvae been reading, with raging anger, some of the negative comments and sometimes elaborate articles on its own right written as a comment in a patornizing and insulting manner all of it puportedly in response to Dani's posts.It just shows the writers ignorance and the capacity of eveil.The most annoying of these is the ones that try to find some sort of political message where it doesn't exist and some narrating a conspiracy theory of sorts. (I can give numerous examples). I would have loved to see a countering argument and a civilized deabate without loosing our time honored "Yehabesha Chewanet". Dani you have inspired us.pleas keep it up.GOD BLESS! God Bless U & Your Family Dani!!!!!!!! !